A Serious Job for Serious People! Home Demolition Services for residential, industrial and commercial clients in and around Acton and Southern Ontario. 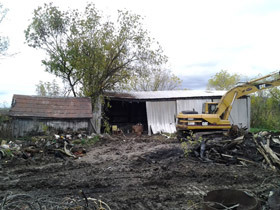 Eco Demolition utilizes techniques to professionally and safely accomplish client needs. We specialize in both partial demolition and full demolition of structures 4 stories or lower in the Acton area. Eco Demolition is a Green Demolition Company focused on the safe removal of hazardous materials from structures such as schools, homes, rural buildings, agricultural sites, brown fields, industrial buildings and institutional buildings in Acton. You may contract Eco Demolition to demolish / dismantle any structures 4 stories or less. We service malls, ships, tankers, locomotive structures, underground parking areas, any site in Acton where demolition and environmental impact is a concern, for complete or partial dismantling and site remediation. Dismantling of industrial/commercial sites in Acton is precise work requires a professional organization. Eco Demolition's team of trained professionals will dismantle and remove site materials to our client's specifications. We specialize in HVAC room deconstruction and removal. Asbestos abatement and hazardous materials are a reality in sites requiring dismantling. We have special procedures and trained staff that follow strict rules and regulations revolving around these types of materials. We believe that our environment is precious and seek to improve and preserve it by taking the necessary steps to complete Acton demolition projects on time and on budget. Are you looking for a local, reliable home demeolition services contractor? Try Acton Demolition Services. 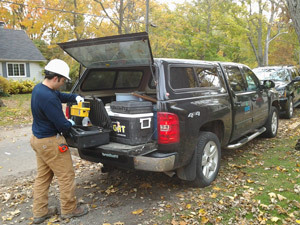 Our home demolition services provides Demolition Service to Acton and the neighboring communities of: Everton, Rockwood, Eden Mills, Guelph Demolition Services, Fergus, Erin, Halton Hills Demolition Services, Ballinafad, Brampton Demolition Services, Georgetown Demolition Services, Norval, Milton Demolition Services, Campbellville, Moffat, Arkell, Ennotville, Orangeville, Oustic, Orton, Hillsburg and Inglewood. Here are a few reasons why Eco Demolition Inc is the best demolition services company to use for Home Demolition in Acton. Proud Member of CARI "Canadian Association Recycling Industry"
A standard 1800 square foot house takes approximately one day for asbestos removal, one day to strip it out and two to three days once the excavator and trucks come on site. Do you leave the site cleared to the builder's requirements? Yes. We demolish all buildings and structures; remove appropriate vegetation, footings and any building rubble under the surface. The site is left clean and graded, ready for new construction. Yes. All asbestos removal is carried out by our own licensed staff in accordance with Occupational Health and Safety and TSSA regulations. Our technicians are Asbestos Type 1,2,3, 253W and 253S Certified. How much notice is needed to book in a demolition? Two to three weeks is generally needed to organize demolition permit applications and to arrange all utilities and site services to be abolished. Do I need a permit to demolish my house or other structure? Yes. A Demolition Permit must be obtained from the City or Municipality in which the structure is located. A demolition permit is required to demolish all or part of a building. The demolition project can not start without a Demolition Permit. For your convenience here is a link to the Acton's Building and Demolition Permit page. What if my house or building has good bricks, tiles or other salvageable materials? What about the Utilities? Electricity, Gas, Water, Telephone and Cable supplies to the building? The electricity and gas will need to be disconnected at the property line prior to the start of any demolition work. Water can usually be shut off at the property line, whilst telephone cables can be cut, rolled up and attached back to the pole. Disconnecting the services is crucial to quick progression and should be done as soon as possible, as it can take between two and three months to organize this with the utilities. Who organizes permits and service disconnection? 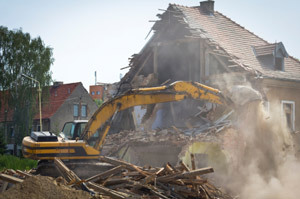 Eco Demolition can collect the information the owner needs to start the demolition permit application, and can assist with the utility disconnections. Any tree removal permits need to obtained by the owner of the property. Are you a licensed demolition company? Demolition companies as such do not require a license to demolish structures. However, Eco Demolition is an Ontario Corporation Certified and Registered with TSSA, MTO and the WSIB. Our technicians are Asbestos Type 1, 2, 3, 253W and 253S Certified. We are fully insured with 10 million in liability coverage. ©Copyright 2019 Eco Demolition Inc.